Webcomic Oatmeal provides a helpful checklist of things to avoid on Twitter. “Ten things you need to stop tweeting about” suggests that you refrain from tweeting about the usual suspects: your food, your kids, your emotional breakthroughs. 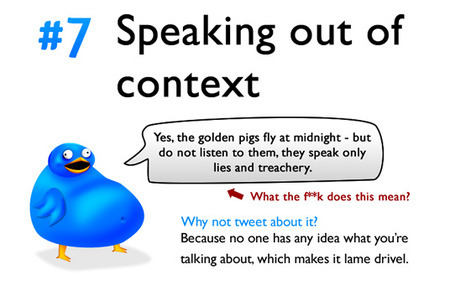 I largely agree, but with the exception of their seventh no-no: speaking out of context. Look at the lovely example they give. Where would we be without these random gems? Though, as with all sorts of whimsicality – don’t do it too often Tweeters. 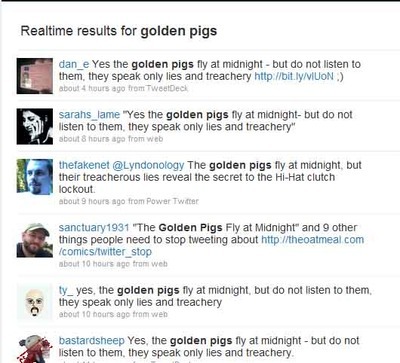 Twitter has unofficially voiced its approval of “speaking out of context” by retweeting the golden pig tweet something chronic: check out the search for the term “golden pigs”. See we all like the golden pig effect.